The first three days of 2018 Tour de France has looked a lot like the your average run-of-the-mill Spring Classic with lots of crashes and both Peter Sagan and Greg van Avermaet taking a turn atop the podium. For Stage 2 winner Peter Sagan, who has already equalled his win total from last year’s race he was later disqualified for after Stage 4 crash with Mark Cavendish, conceding the yellow jersey to rival Greg van Avermaet, whose BMC Racing Team dominated the team time trial on Monday, his time spent in the maillot jaune was appreciated albeit brief. 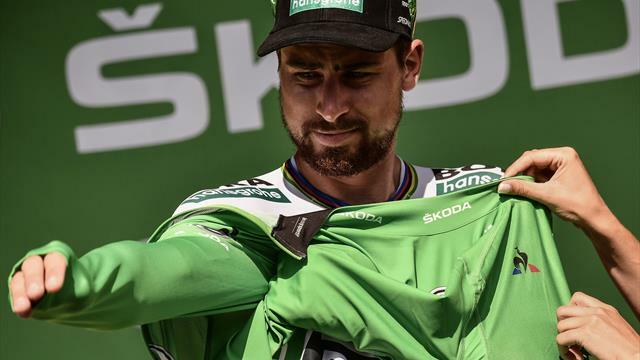 The reigning three-time UCI world road race champion lost contact with his Bora-Hansgrohe squad with six kilometres to the finish on the 37.5-kilometre time trial course. For Sagan’s team-mate and Bora general classification contender Rafal Majka, any chances of winning the 105th edition of Le Tour became a bit slimmer as he is now 11th overall after his team finished 50 seconds down to BMC — and 46 seconds to defending four-time winner Chris Froome of Team Sky, which claimed second overall on the day. As for 2016 Olympic champion and last year’s Paris-Roubaix winner Van Avermaet, whose team is riding for Australian GC contender Richie Porte, it was a thrill to don the yellow jersey for the first time since 2016. Mitchelton-Scott is looking strong at the 29th running of the Giro Rosa after taking second in the team time trial to Sunweb in the opening stage, and then taking back to back sprint stage wins with team rider Jolien D’Hoore. The 28-year-old Belgian won both Stages 3 and 4 in the 10-stage Women’s WorldTour event, despite finding herself hurting on the catégorie 3 climb midway through the race. “We rode really well today, we always stayed together to keep our general classification leaders safe, also in the final,” said D’Hoore referring to team-mates Annemiek van Vleuten (NED) and Amanda Spratt (AUS). “I did a lot of work and I was dropped on the climb. I didn’t feel like I was having my best day today but everything came back together and again it was a bunch sprint. Spratt and van Vleuten find themselves fifth and sixth on GC respectively, with Mitchelton team-mate Gracie Elvin (AUS) seventh all at 10 seconds off race leader Leah Kirchmann (CAN) of Sunweb. The second edition of the IncaDivide is underway with 35 competitors vying to be the first ultra-cyclist to cross the Andes in Peru and finish this epic 1,800-kilometre unsupported single stage race to gain valuable points in the third round of the all-new four-race Biking Man series. Both the IncaDivide and the BikingMan Series are the brainchild of founder Axel Carion, who himself has crossed the length of South America by bike — not once, but twice — with the latest effort earning the Frenchman a world record of 49 days, 23 hours and 43 minutes. Carion completed the ride from Cartagena, Colombia to Ushuaia, Argentina with Swede Andreas Fabricius. While the IncaDivide debuted last year as a stand-alone event with Peruvian Rodney Soncco taking the men’s race in 16 days 21 hours, while Japan’s Yoshie Yabu winning the women’s division in 24 day 7 hours, this year’s race is one of four races in the inaugural season of BikingMan, which has already included races in Oman (1,000km) and Corsica (700km), with Taiwan (1,100km) still on the calendar. Unlike the Race Across America, which is team supported, the BikingMan series is completely unsupported. However, unlike many of the other unsupported races that have popped up around the world as of late, Carion claims he personally rides every route to discover the safest routes for the riders. Although last year’s race started only 17, this year’s event has 35 riders and is tracking for 150 participants by 2020 with more than 1,000 in total for the series. Carion attributes these projections with the increase in popularity of ultra-endurance sports. “In the 1990s you had to finish a marathon, and 10 years later you had to race an Ironman to be considered an athlete,” explained Carion, who hopes to increase the BikingMan series to 10 races around the globe in the next two years. “Now ultra-cycling is the new standard. "I believe the market for endurance racing prime for BikingMan which is bringing people together on a long-distance adventure series that gathers everything people are searching for, which is not only sports, but adventure — you against the elements, man versus wild." “BikingMan is for people who have a need to actually accomplish something and the series we are building is aiming for that,” he concluded. “It’s not just cycling. It’s an adventure race where the bicycle itself is a medium to move. Then you are on your own. Imagine no more greasy chains or out-of-tune derailleurs. Well, that is exactly what CeramicSpeed envisages with it’s all-new DrivEn drivetrain concept and the world is taking notice. The Denmark-based bicycle bearings manufacturer unveiled its new driveshaft technology co-developed with the Mechanical Engineering Department at the University of Colorado at EuroBike and has garnered an innovation award among 366 entries. CeramicSpeed claims DrivEn creates 49 per cent less friction compared to traditional drivetrain components. CeramicSpeed has created a drive shaft concept that sets a new benchmark as the world’s most efficient drivetrain as it eliminates what the company claims as eight points of sliding friction. “CeramicSpeed has proudly accomplished what many have said couldn’t be done. We achieved a 99 per cent efficient multi-speed drivetrain while eliminating the chain and complex rear derailleur,” claimed CeramicSpeed’s Chief Technology Officer and founder of Friction Facts, Jason Smith. “Advancements in drivetrain technology have been evolutionary since the 1920s.